The Kompac EZ Koat 15 Plus is a small footprint, UV & Aqueous coater capable of coating a sheet size of 14.5” wide by virtually any length. Whether digital output or offset, each job will have the visual appeal, lasting durability, protection and rub resistant finish that your customers expect! Proudly made in the USA, the Kompac EZ Koat 15 Plus is built for 24/7 operation. The EZ Koat is the only UV coating system to feature Digital UV! Environmentally friendly, Digital UV replaces outdated & potentially hazardous ballast / mercury relay systems used in curing UV coatings. The Kompac EZ Koat 20 Plus is a small footprint, UV & Aqueous coater capable of coating a sheet size of 20.5” wide by virtually any length. Whether digital output or offset, each job will have the visual appeal, lasting durability, protection and rub resistant finish that your customers expect! IR Dryer – Dries Aqueous coatings and assists UV coating wet-out for increased gloss levels. Sheet Detection – Sheet monitoring system helps prevent fires and tracks sheet counts. Interface Conveyor – Allows for inline coating on select digital presses. High Pile Feeder – Pallet/Dolly loadable feeder for high volume feeding. High Pile Stacker – Pallet/Dolly loadable stacker for high volume stacking. 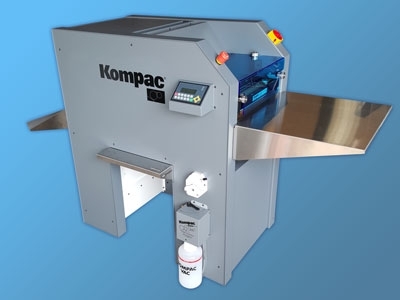 The Kompac EZ Koat 20 Duplex is a UV & Aqueous coater capable of coating a double sided, 20.5 inch wide sheet, in one pass. Whether digital output or offset, each job will have the visual appeal, lasting durability, protection and rub resistant finish that your customers expect! Coating sensor – Automatically detects coating level & replenishes as needed. The Kompac EZ Koat 30 Plus is a small footprint, UV & Aqueous coater capable of coating a sheet size of 30.5” wide by virtually any length. Whether digital output or offset, each job will have the visual appeal, lasting durability, protection and rub resistant finish that your customers expect!